Does My Ceiling Fan Help or Hurt my Air Conditioner? When the temperatures start climbing, all you can think about is getting the maximum comfort out of your air conditioning unit. So instead of cranking up the air conditioning lower, you turn on your ceiling fan. After all, increasing air circulation and air flow in your home helps circulate the cool air better, right? Let’s do the math here. 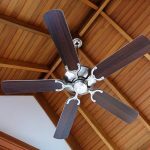 According to CeilingFan.com, it’s definitely cheaper to use just your ceiling fan versus your air conditioner: a central air conditioning system runs about three kilowatts and costs 36 cents per hour, versus a ceiling fan running 30 watts, costing only one cent per hour. But we know that utilizing only a ceiling fan would still make it difficult to combat the heat and humidity we have in Southeast Texas. Before there ever was central air conditioning, ceiling fans were the tool for comfort starting in the 1880s. While we all know that ceiling fans circulate the air from the ceiling. While that air circulation doesn’t necessarily lower the temperature in the room, it works like a wind chill in that it can exploit the air temperature across your skin. As the air moves across your skin, it disperses your body heat, evaporating perspiration, thus making you feel cooler. If you have your ceiling fan blades rotating correctly, the blades will direct the air straight down (counter clockwise) on the occupants in the room. A thermometer in that room could read 86 degrees, but you might feel like it’s five degrees cooler because of the fan’s chill factor. Consider using a ceiling fan as part of a team to bring your maximum home cooling comfort. Adding a ceiling fan can allow you to actually turn up the thermostat, saving you energy and money. Earlier we said that an air conditioner can cost approximately 36 cents an hour, and a ceiling fan costs approximately one cent per hour. If you bump your thermostat up four degrees, that can reduce central air conditioning costs by 17 cents per hour! Another way to conserve energy and cost is to make sure your ceiling fan is only on when the room is occupied. Remember that because of the air chill factor, a ceiling fan won’t cool the room, but just make it feel cool to you and your pets. So if no one is occupying the room, turn off to save more money. Talk with the experts at Air Specialist to see how they can help you reduce your utilities and cost this summer, while staying cool and comfortable.